Grey is a member of the Integral Institute. 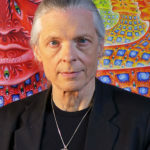 He is also on the board of advisors for the Center for Cognitive Liberty and Ethics, and is the Chair of Wisdom University’s Sacred Art Department. He and his wife Allyson Grey are the co-founders of The Chapel of Sacred Mirrors, a non-profit church supporting Visionary Culture in Wappingers Falls, New York. "In a society that tries to standardize thinking, individuality is not highly prized."